How Far is Navanidhi - Nakshatra 5? Far away from the maddening crowd said a poet once! When you travel from the heart of the city to the outskirts of the growing decorate its extensions in the south. These are virgin spaces, untouched by development yet. There is a breath of freshness in the air, which is rich in moisture. 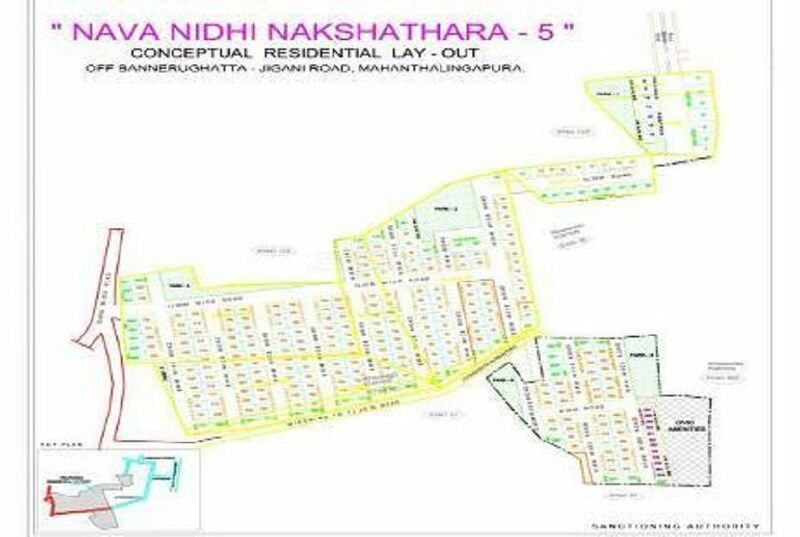 The "Navanidhi Nakshatra-5" a unique project of Navanidhi Developers & Builders is situated near Mahanthalingapura Village, Jigani Hobli, Anekal Taluk, Bengaluru Urban District. "Navanidhi Nakshatra-5" is a premium living space spreading its wing in between the pristine setting of Bannerghatta National Park. The natural hillocks and the lakes and with natural fresh air are so picturesque that it will surely bring back the nostalgia of old Bengaluru in its prime. Navanidhi Nakshatra-5" is also blessed with natural stream or nala, that runs through the property adding enormous beauty to the terrain, with a water table that is conditioned to remain rich for years. The natural ambience is so fertile that it will open your eyes and hearts with a single song.